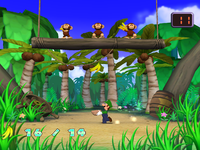 Banana Storm is a minigame in World 2 of Dance Dance Revolution: Mario Mix. The player needs to tap left and right on the Dance Pad to have Mario or Luigi collect as many falling bananas from the Ukikis as they can. The Ukikis will show the player what they will drop before they do so. If Mario or Luigi catch a spiny, they won't be able to move for a short time. It's raining bananas! Try to grab as many of them as you can! Look out for the Spinies though! This page was last edited on October 28, 2018, at 17:27.